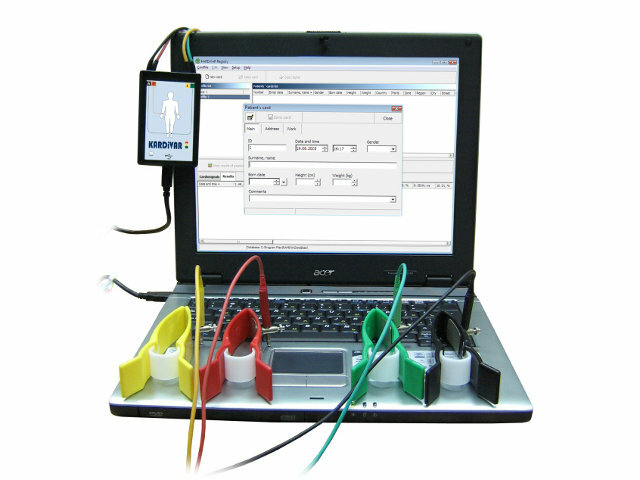 Heart Rate Variability Testing is like an MOT and health status for your body. Are you really healthy on the inside? Some people may look healthy on the outside; however, looking healthy is no reflection of what is going on inside the body.What if you could get a snapshot of what is going on inside of you? Would you like to know how stressed your systems are? The knowledge acquired from Russian scientific space medical research is now here in the U.K and available for everyone to benefit from. The benefits are many and include: maximum potential physical energy, an increased ability to cope with all stressors, a healthy body weight and ability to maintain it, improved immunity, good quality sleep, a sharper memory and an expanded fitness level. Steve Bishop is one of only a few health practitioners in the UK to offer Dr Michael Kucera’s HRV analysis test and mitochondrial supplementation (space medicine). The HRV test is a simple non-invasive test that measures the signals from the heart to the brain and the other organs. The signals measured are recorded in microseconds, evaluated and a printed report is then produced. This record provides a lot of information indicating the internal health and efficiency of your regulatory body systems such as the sympathetic and parasympathetic activities of your autonomic nervous system and the hypothalamus & pituitary glands. Whatever the source of your stress if your body cannot adapt to meet its challenges then it has very real physical effects. Symptoms can include: anxiety, blood sugar fluctuations, depression, dizziness, fatigue, hair loss, hormonal imbalances, infections, indigestion, insomnia, light sensitivity, low body temperature, memory impairment, mood changes, weight gain and difficulty losing weight, low energy etc. Crucially, it indicates your ability to adapt and react to the sum total of all stressors that you may have been negatively influenced by. Once this information is known, an appropriate course of support can be offered to address and restore any imbalances. The Heart Rate Variability (HRV) is an indicator of the neuro-vegetative activity and the autonomous functions of the heart. It describes the hearts ability, the time interval from heartbeat to heartbeat (RR – Interval) changing continuously, so one can adjust the inner and outer stress and strains. This ability of the heart‘s adjustment is based on an optimal interaction of the sympathetic and parasympathetic nervous systems. In simplistic terms, an HRV test measures how stressed your body’s systems are. Chronic stress can lead to overload and exhaustion of the hormonal, cardiovascular, neural and muscular systems. This can lead to poor recovery and repair of the body’s systems. Long term consequences include an impairment of the immune system, delayed healing and musco-skeletal overload. Is it any wonder why people feel tense and stressed! The duration of the ‘KARDiVAR’ HRV test is 5 minutes measurement duration (including ECG) whereby the Heart Rate Variability will be determined. 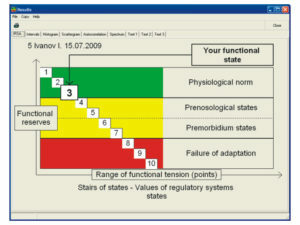 Four graphics will then be shown and the computer will display whether the nervous system is in homoeostasis (balance) or whether deregulation (eg: stress & burn out) exists. A traffic light system shows the evaluation clearly and the data printout will enable you see what is really going on inside your body and establish your functional state. Should I get measured? If you are suffering from any of the following stress related conditions, then yes. Mental or physical stress — ME — Fibromyalgia — burn-out syndrome — chronic diseases— sleep disorders — allergies— chronic pain— very overweight—before and after surgery — before, during and after chemotherapy—in competitive sports for training management — also beneficial to sports athletes to maximise performance (by understanding your physiological state). Does HRV testing diagnose or treat medical conditions? No. Mitochondrial therapy does not diagnose or treat diseases. Mitochondrial therapy is designed to retain and/or to regenerate cellular function back to its maximum potential. This then provides a platform for the body to rebuild health from the cellular level, which in turn has a positive effect on the organs glands and systems of the body. The fee for an HRV test is £60.00 with a printout of the results. Full details at www.SteveBishop.co.uk 0800 1974 294.